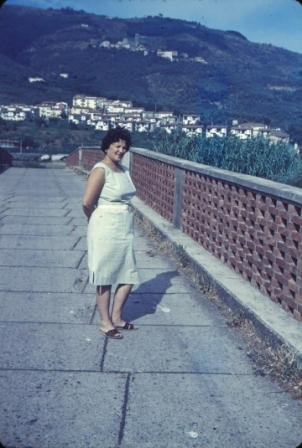 That’s my mom in 1964 from her hometown in Tuscany, in between Pisa and Florence. She’s standing on a small bridge that is special to me for a variety of reason. The small village way up the hill is where my grandmother was born and grew up. The bridge crosses a small river where I occasionally played. The bridge didn’t get much traffic, thus the road was gravel. Greenhouses and a few carnation fields lined each side of the road. A the far of the road was the stone apartment building where my mother and her siblings were raised, and where my grandparents still lived when I last visited. I remember the stone entrance and stops as I walked to the third-floor apartment, which was small with a stone floor. No – this wasn’t the Tuscan villa of our dreams. My grandfather was tall, quiet, and stern man who provided for his family by working in a factory. I also recall waiting for him at the end of the street for his return home. My grandmother was the stereotypical short, smiling, pleasant Italian grandmother who was a domestic goddess with her cooking and sewing. Mom was the fourth of six siblings. The oldest, my uncle, was in a wheelchair, thus live at home his entire life. The next was an uncle that I never met because he died in an accident in his 20s. Four girls followed – two older aunts, my mom, and my youngest aunt. 1964 is a long time ago. Since then, most have died – my grandfather (1964), my uncle (1965), my grandmother (1973), Mom (1987), the oldest sister (2010), and the second oldest sister (2012) – let alone the spouses and my dad (2010), my paternal grandparents, Dad’s two sisters, and their spouses. So that leaves Mom’s youngest sister, two first cousins that I last saw in 1964, and two first cousins that I have not met. Well – that’s where I’ve been as I just returned from my first visit to see my relatives since 1964 – visit to focus on my last tie to my Mom – here youngest sister – and yes, my four first cousins and their families. Obviously, the first encounter involved hugs and tears … and then we ate, drank, and laughed … and that was only day 1. This entry was posted in About Me and tagged A Frank Angle, About Me, Blog, Blogger, Blogging break., Family, Italy, Personal. Bookmark the permalink. Poignant Frank. And welcome back. Are you in that picture? If so, where? Loved the word “poignant” because I would say that is one characteristic I was hoping for. Oh, reconnecting with family can be so rewarding! I am so glad you were able to make the trip and share this testimony with us. Obviously the trip was overdue, but I hope to explain more soon. To me its one of the best therapies in the world ..to meet relatives go crazy remembering all the fun moments we had..
Lovely pic….are you in the picture? I saw the notification that you posted while I was gone, so I’ll be over. The trip was good therapy, including some crazy time. Fitting for this post, I’m in the middle with my aunt. Very happy you could reconnect with your roots. A restoration of a connection it was … but in some ways, it was travel back in time. Many thanks … and is your comment that is like a “welcome back” to me. “Very special” is a good phrase, and that was one of the themes I wanted in this post. How wonderful for you to get to know your family. I hope the visit was all you wished it to be. The experience delivered many emotions … but I will admit, there were several “hoped for” didn’t happen. But over all, a thumbs up. I’m very happy you could meet your relatives. The combination of seeing after so many years and meeting for the first time was quite the experience. How cool you got to hook up, and such a beautiful part of the world. Very cool indeed and with a myriad of emotions … plus I got to several places I had not been. …and a lot of catching up! Overwhelming in many ways … thanks for noticing that emotion in this post. yes, which one is you? Fittingly for this post, center with my aunt. Travel is always nice! Sounds like you had a great time! It was a good trip … besides, I didn’t have to deal with the east coast battle with the white stuff! I’ve been reading about that, it sounds pretty severe. I didn’t know about it until I called my in-laws, who were surprised I was able to return (but they didn’t know my itinerary). They said, “I can’t believe you made it.” …. and I responded “Why wouldn’t I?” … and then they told me. Sweet story, Frank. I’m glad you were able to reconnect. Thanks. Strangely, I got the idea for starting this post with my mother before I started the trip … so the image was in my head throughout the trip. It looks like your aunt doesn’t want to let go. And it looks like you were very content to be doted upon. Lovely family photo. I’m sure you asked many questions. Great memories Frank. You are blessed. Well said … blessing and memories all at once! Welcome back, Frank. When I saw that you’d posted I had to open you up right away. So glad you were away for such a positive reason. Italy. What could be better? Oh, yeah, Italy with family. As you know, I only said I would be away — but heck, even with many people I know here, I didn’t say much about where I was going. … sometimes, “Just going to see family.” … then my wife would provide the where info. I will have more … but it is also good to be with my blogging friends. A Saturday isn’t complete without you! Thanks Elyse … and hopefully a cartoon post next Saturday. Frank, this sounds like a trip long overdue. I picked you out immediately and the pose, well just lovely and loving. So many lost along the way to making this trip happen. Poignant, perhaps but reaching out to create longed for and hoped for connections is always thus. I am glad you did this, even if it did not fill every hoped for hole, perhaps it begin the process. Well shoot, I got the sniffles again….very touching post Frank……the image just got me… my eyes went immediately to the center of the image and the loving expression of the woman with her arms around ( as it turns out) you! Yep … interesting how that last picture summed up the trip and this post. … and yep, that’s my aunt with me ,, the rest are my first cousins and my sister. What a wonderful experience that must have been. 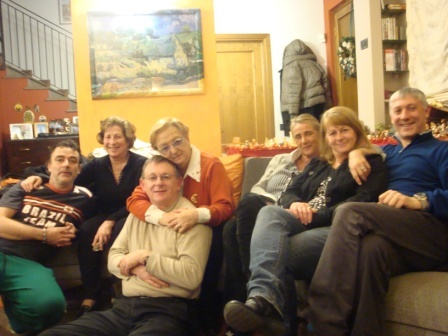 My mother reconnected with relatives in Germany several years back and had an incredible time. She’s been back a few times since and says I should go with her. But you know me–the thought of staying in a strange home with people I’ve never met scares the daylight out of me! In terms of the views, it was all right there … in one direction the plains and the rolls … in the other direction the small mountains with the small villages dotting the slops. In terms of your Germany connection, I would say go with Mom because he won’t want to regret it over time. Wonderful and poignant post; it sounds like you’re surrounded by good people! Lovely pic of your mom. Take care of yourself! my grandmother grew up in bari, southeast italy on the water. my grandfather grew up in santomenna, a mountain village halfway between bari and naples. there are about 500 people living in santomenna, and about 50 of them are related to me. my grandfather and his father made their own wine, and when he came to america at age 16 he brought some of the equipment with him, which is still in the basement of my father’s house. the whole basement still smells like red wine even though nothing had been made for about 40 years. I continue to be amazed how much we have in common. I actually have my grandfather’s wine press in my living room! … and can easily recall the smell of my grandfather’s basement! Frank, A touching post. I want to hear and see more. I was wondering where you had gone. Many thanks for the nice comment. HOPEFULLY, we must make sure we have breakfast together very soon. Really touching post Frank. I can feel the mix of emotions coming from it. I’m glad you enjoyed and reconnected. I’m also glad you made it back safe and sound. I am always envious (a little) with people who can connect with relations this way. My family is not close at all. It’s sad but it is what it is. I love reading posts like this and look forward to your next one. Thanks for letting me know about the mixed emotions because that’s very fitting. Interestingly, I learned a lot about them while there … both positives and negatives. Nonetheless, a good trip. There are always positives and negatives with people. Especially family. That’s what makes them interesting. Isn’t it interesting how your last post related to this one! Meanwhile, glad enjoyed this. Frank, it’s a beautiful post. Wonderful, Frank. Yes, I agree, this is quite poignant. It’s great that you can reconnect with your aunt and cousins you have never met. Whenever, I reunite with family, I feel the passing of time in a huge way. I always have a moment of, “Oh, we shouldn’t wait so long next time.” Then again, it’s so wonderful that you managed to get together. Even though it wasn’t the Tuscan villa of your dreams, there is something charming and romantic about the bridge with greenhouses lining the street. It’s sounds so simple and nice Welcome back! Where are you in the picture, if you don’t mind me asking? Amazingly the street was very similar – but the street was paved at there seemed to be a cut-through street, but one way. Though vacant, the apartment building still stands. I’m very glad I made that walk by myself. As for the pic, I’m center in front of my aunt. The others are my four cousins and my sister. It must have been nice to go down memory lane, and especially to remember it on a walk by yourself. That way no one can interfere with those memories. Ah, there you are! Very much so … and yes, I got to take that walk by myself. More later. I looked for you as from the air, but there were too many clouds. Welcome back, Frank and I’m so glad you went to see your family in Tuscany. So very important to maintain those connections. And, yes, food seems to be high on the list of things to do for Italian families. No wonder you have become a wine connoisseur! It’s in your genes! And I truly mean that in the best way. I look forward to hearing more about you time there. Regarding wine, I was given it at an early age … a small dose of wine with much more 7up. 🙂 I must say that two of my cousins are also really into wine – and good wine at that! Meanwhile, I’ll probably have another post about the trip soon. Thanks for the warm greeting. It was a wonderful place … and the right place for me to be. It is always a wonderful thing to connect with family. It is good that you had the opportunity and that you enjoyed the experience. So that’s where you were 🙂 Nice trip and idea to meet up with your family in the ‘old country’. I would ask why you left it so long, but I know the answer, we all leave things a little too long, but you made it and that’s the important thing. Good on you! Good question … and one that is a bit complex involving timing and family dynamics. However, I’m glad I went. Bentornato, Frank! (Parli italiano, si?) Mi piace molto la foto della tua famiglia, e te—che bell’uomo! Capisco molto migliore di parlo – ma parlando ha migliorato ogni giorno. Molti ringraziamenti! Ciao! I will work in other stories about the trip around my regular stuff. Glad you appreciated this. I look forward to hearing more of the story. Do you have a photo of yourself on the bridge? Is it still standing? We visited the Pisa-Lucca area a couple of years ago – our friends son and his family lived on a little farm there. What a beautiful part of the world! The bridge is still there. I was alone the day I walked it, so no pictures, … but I did take many on that walk – so I image a future post is in the works. My aunt was glad to see us, and interestingly, she held up better on our departure than I did. Meanwhile, during you visit, I hope you got to travel into the mountainous area just north of Lucca. More to come! All of it sounds special and emotional but the picture of your beautiful mother brought back memories and nostalgia. Special and emotional are good words to describe the trip … and yes, I got the chance to cross and stand the bridge, walk the road to the apartment building …. and alone, which was the best part. Loved the intrinsic beauty and nostalgia of the post- so poignant and relatable. Many thanks. It’s been interesting for me to read the adjectives in the comments because so many of them express what I was hoping to accomplish. Good to hear from you! Much can happen in 48 years, but you are right, “overwhelmingly special” is a good description! Such a sweet and poignant snapshot of a family history. Thanks. Thank you sir …. and more to come. Woo hoo … glad you enjoyed this … and the family pic is one I enjoy as it also fits the story. Nice family photo, Frank, and I think your mom was a very beautiful lady! Many thanks for the kind words. Much of the post was in my head for some time, thus a way to announce where I’ve been (as opposed to announcing ahead of time). By the way, I will have more posts about the trip … and in a personal story form as well. Hopefully one of two this week. Thanks!!!! Awesome 🙂 Have fun. It’s beautiful. This is so cool, and funny because I literally just got up from the couch about 2 minutes ago, from watching ‘Under the Tuscan Sun’! Welcome … well, I think you are a first-time visitor. …. and wow … what timing with the movie featuring the beautiful Diane Lane. I hope you return … and I’ll stop by your site soon. Thanks for taking us along with you. How special for you and your family, especially as it seems to be kicking up many precious memories. Lovely. The trip was very important to me, and I hope the next post is about why. Glad you enjoyed this. Very nice picture, Frank. Lovely to read about your family. So glad you were able to go back and visit with some and relive some memories. Lovely, Frank, just lovely. I am so envious of people who have such depth of family relationships. It’s the way life was supposed to be. So glad you got a chance to go and so glad you’ve returned. We’ve missed you. Greetings … and I miss you and many others too! It was quite the trip with emotions for me from A to Z. More to come! Oh, man! Growing up without family, apart from those who share my roof, makes me enjoy the heck out of the post . . . all the more so since my blog brought me in touch with one of my cousins, who then put me in touch with the other two. It’s been almost a year since I saw the first cousin’s kids playing with my own son, but in my heart, it’s as if it was just yesterday. I can’t wait until November, when (it seems) they’ll likely be back again. I look forward to hearing more about your family adventures, assuming there’s more to come! Wow … thanks for sharing a portion of your life story because of this post .. and I can sense your excitement for the November meeting. More stories are to come … hopefully the next post will be one. Thanks for your interest. You have such a way of telling a story – makes it so real. Could just feel the the stone bridge – carnation fields? And such emotion looking up at the entrance – a small boy waiting at the end of the road for his grandfather. This was an important trip – so glad you went….and more stories! more stories. the little river: fast flowing or lazy, stones to sit on, cold water? Rest up, but expect plenty of us to pull up a chair for the stories. Many thanks for the kind words. I will tell you that the stream is relatively quick moving as it comes out of the hills, but it’s a little slower at that bridge. If I would have had more time, I would have touched the water. More to come. You are more than welcome. Hope you also read the why post. If all goes according to plan, another post on Thursday. Not quite “back” myself, but VERY glad to both see you back, and to see your family – not to mention very glad for you, for the good time you obviously had. Now I gotta bounce back to your “Why” post. See ya over there, and welcome back! Good to see you back in the saddle! Oh, Frank, what a moving story! Amazing to think it had been so many years since you saw your remaining family. What a reunion it must have been! I’m so glad you saw this because I knew you would appreciate this post. The one on Why explains more … plus more posts will come! … and yes, a good reunion. 1964 was a long time ago, as you say, Frank. But I remember it well, and the concerns we had then, and our hopes and our fears. Your mother looks so beautiful standing on that bridge, and your family too, as they gather to celebrate your visit. How wonderful that you were able to get together with your family like that. What a beautiful post! Interesting how certain memories still with us with dates attached. Thanks for you kind words. Very nicely done Frank. Happy for you to connect with your mom’s family again after all that time! Glad you enjoyed this post. It was a good trip – and my next post (within the hour) will be about my walk across that bridge. Hope you stop by. family and friends is really what life is all about – I love that you are drawn to connecting up your family and memories like that. Very powerful stories you’re telling here! Oh, and its good to see your face! This was my first post back, and all my readers knew was that I was taking a break. This post also sets up the others. What an amazing thing to do. I’m so happy for you that you were able to take that trip after so many years. It puts it all in a new light. Thanks for sharing. Thanks for revisiting the beginning. Pursue ahead the that bridge reappears … and the tale of my walk. nice family frank.. ur mom is cute n beautiful..
That’s my mom’s last surviving sister … heck, my only surviving aunt … plus my sister and our cousins. Keep going .. the bridge returns soon. That is so wonderful that you got to reconnect with your family in Italy! You have a lovely family Frank..And it must have been a wonderful family reunion.. And I thank you for sharing and pointing me to this post I missed… 🙂 Distance doesn’t distance the heart connections..
That’s for following it. It was a good trip … and hopefully I can repeat it soon.